We’re now stocking a great range of wooden train and railway sets. I am chuff chuff chuffed to at last be welcoming aboard BRIO and their beautiful and traditional wooden trains and if you’ve thinking about children’s Christmas gifts already (sorry but you know it’s coming round fast), you can’t go wrong with one of these sets. They’re sturdy, detailed, tough, tactile and easy to assemble. They’re beautifully made but have endless possible combinations so they’re also challenging and diverse too. Made predominantly from sustainable wood, they’re also imaginatively designed with brightly coloured accessories. Brio make lots of clever, innovative and inspirational additions and accessories so that your train set grows and develops with your family. Designed for different age groups from aged 2+ and easy to manipulate, the different sets also have endless potential and are a great way to encourage family interaction. They’re specifically designed to encourage creative and imaginative play, problem solving, dexterity and a better understanding of travel and transport. Brio have a great track record on safety throughout the whole production process from beginning to end and including their suppliers and are and as they say “The strictest tests are the ones we do ourselves”! Brio have signed up to the toy industry’s Code of Conduct (ethical rules relating to workers and working conditions and compliance with statutory and other official provisions) and take responsibility for ensuring their suppliers comply too. 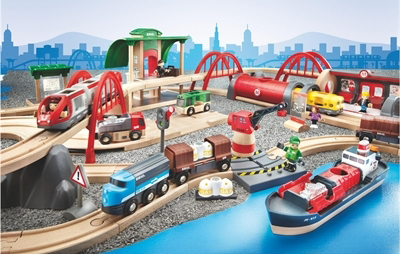 Brio are at the top of their game when it comes to quality and ethics and with the many years of use you’ll get from these sets, they represent real value for money. They’ll quickly become a cherished part of childhood memories for you and the kids and before you know it you’ll be handing them down to the next generation. Well, those are some of my reasons for choosing Brio but I love to hear your wooden train passion to. I’ve got some parent bloggers to guest post about their wooden railway experiences later this week and I’d love to hear your memories too. When did your child or you get your first wooden train set? Which one? How did the collection grow? Which additions did you buy? What is the best part? What else do you want to share about your families’ wooden train play? Or why not let us know if you would be interested in a guest post too. And anyone out there got any old photos of you and your Brio set or wooden trains? Send them to us on Facebook or via mail to info@ and we will post them if you let us!